There was a sense of expectancy in the air. Members of Victoria Lodge No 4629 all knew George Tuthill well, but how well? As is often the case, 50th celebrations reveal a lot of unexpected details about a person’s life and this celebration would be no different. Kevin Poynton (left) congratulating George Tuthill. The lodge was opened in the usual manner by Frank Tuzio, following which, the lodge was honoured by the presence of Assistant Provincial Grand Master Kevin Poynton. Frank offered Kevin the gavel of the lodge, which he accepted. On accepting Kevin then occupied the master’s chair for the most important part of the ceremony. Kevin made sure that George was sat down and made comfortable for what was about to follow – his life story! It has been said that the greatest of all happiness is to know that you are loved. The very fact that so many brethren attended George’s 50th celebration only serves to reinforce that statement and also shows the high regard that everyone present that evening has for George. George was born in August 1936 to parents George and Violet, their home being in Spellow Lane Walton. George’s father was a blacksmith and his mother was a cleaner at Walton Hospital, later running her own café. They also had three daughters namely Violet, Lily and Jennifer. The family moved to their new home in Firdale Road in Walton, which was next to the Dunlop factory that was later destroyed during the war. It wasn’t just the factory that got destroyed; George’s house did too and made the family homeless. Schooling for George was local, starting out at Rice Lane Infants and later at Longmoor Lane Secondary Modern School. After leaving school George spent a year working as a clerk at the rent office in Lime Street before starting an apprenticeship at the Royal Ordnance Factory, which produced 303 rifles and the newly invented ‘Sten gun’. The first task that an apprentice had to do was to make their own tools and George still has some of those at home today. National Service followed where George was posted to the infantry at Ladysmith Barracks in Ashton-under-Lyne. There George was given every weekend off to play football for the Royal Ordnance Factory, and later playing for the battalion. Military service took George to Malaya where he continued playing football, this time for the combined forces team. It was not all about football though; George did very well in his jungle training which is why he was promoted to the rank of corporal. In 1960 when his National Service was completed, George returned to the Royal Ordnance Factory for a short while. Being peacetime meant that demand for rifles and Sten guns was no longer what it was and so within a short while the factory was destined to be closed. George was given notice of redundancy. Undeterred George got himself a job at the Otis Elevator Company in Kirkby working as a machinist before joining Whitley Lang & Neil, an engineering company in Speke. Romance was soon to blossom! George met his future wife, a lady called Enid who worked in the tea counter at the Harlequin Dancehall. It was a real-life case of love at first sight and the pair got married in March 1962. In fact, the exact date was 31 March 1962, which just happened to be Grand National Day. George clearly had picked himself a winner! A son named Graham soon came along and many years later on leaving school Graham achieved a degree in chemistry. Although his ambition was to work on the oil rigs that never quite happened. Instead Graham went into the fashion industry with his father George and they both made a good living from it. George is still active with the business today, after all these years. In 1969 George moved to West Derby and then in 1990 another move, this time to Great Sutton where he lives today. There George and Enid played very important roles in the community for over 20 years. Sadly in 2015 Enid contracted motor neurone disease that affected her mobility and in February 2017 Enid passed away. George continues to be part of the community and is currently the Vice Chairman and Licensee of Capenhurst Village Hall. With the help of supporters between 150 and 200 people are served meals every Wednesday at the Methodist Church Hall in Ellesmere Port. In fact, it is so popular that people start queuing at 10:45am despite the doors not opening until 11:30am. George and his community helpers have also developed a good relationship with local stores and have developed and implemented a strategy that prevents good food going into landfills. This means that people coming for the Wednesday meals have the opportunity to pay £4 in exchange for a bag of food worth £15 – £20. George was introduced to Freemasonry by his neighbour Tom Travis over 50 years ago. Two months after George had expressed interest in becoming a Mason, he found himself in a room with 7 people asking him why he wanted to become one. That was difficult for George because the only thing he knew about Freemasonry was the excellent social evenings that his neighbour had told him about. It was not a problem though, George was proposed by his friend Tom Travis and seconded by Geoff Baker. In January 1969 George was initiated into Victoria Lodge. 10 years went by, during which time George progressed through the ranks before being installed into the chair of King Solomon in October 1979. The four years following that appointment George was the lodge treasurer, and in 1989 George was appointed by the Province to the rank of Past Provincial Junior Grand Deacon. That same year George was exalted into the Widnes Chapter No 2819 as well as becoming a Mark Master Mason, joining the Tuscan Lodge No 1099 in Liverpool. George’s Masonic career was as exciting as his commercial career and success was achieved in both. George was very active on the social committee and with Enid they produced some spectacular social occasions over the years. It is because of the dedication of George and people like him that the Victoria Lodge has prospered so well over the years. 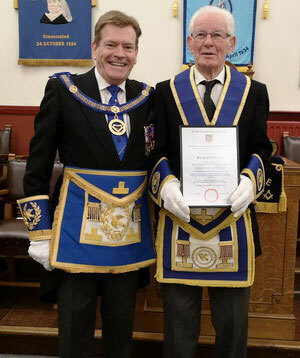 In recognition of this joyous occasion the Provincial Grand Master Tony Harrison had issued a certificate and Kevin Poynton asked the Widnes Group Chairman Neil Pedder to read the certificate and then Kevin present the certificate to George, marking his special 50th celebration. Over 40 brethren attend the ceremony and after which all went on to enjoy a very special festive board. A toast to George’s health was proposed by John Baldwin and then the Widnes Group Chairman Neil Pedder presented George with a gift and a 50-year pin badge from the Widnes Group. John Baldwin also presented George with a gift of a mini decanter and glasses, making the whole evening a very special occasion for George and everyone who was there to celebrate his life with him. The evening will be warmly remembered for many years to come, as will the extraordinary life story of George Tuthill.